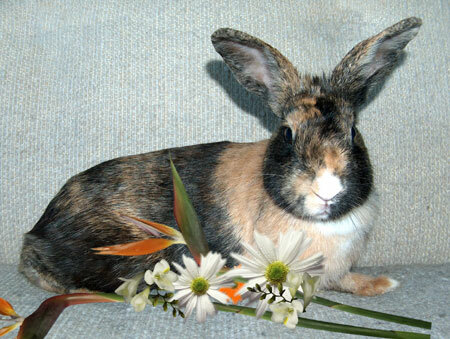 I am a permanent sanctuary rabbit at SaveABunny getting the special care I need and am also bonded with Phoenix! Hello. My name is Melody. I am a real survivor. I was named Melody, because I am an exquisitely beautiful, spayed harlequin girl with a symphony of colors that create a tapestry of living, breathing art and music to the eyes. My story started off very sad, but now I am doing well. I was extremely malnourished and depressed at a shelter that did not care for me. I had an untreated ear infection and the pain was so bad that I stopped eating and had practically given up hope. I only weighed 3.5 pounds when I should have weighed about 6.5 pounds. It is also believed that I had been physically abused and hit by my previous guardians. At first I was very weak and shaky. I could barely stand. Yet, my will to live was strong. I decided I wanted to live. Slowly, but surely, I started to regain my strength, my hope and my trust in people. Medically, I have fully recovered, but psychologically I still need healing and a lot of TLC. I really want to trust people and be loved, but I am afraid. I tend to whimper and cower, so I need a very gentle, patient and loving person to care for me and love me. I respond very well to food treats and gentle touch. It is soothing when people talk softly with me. I am one of the prettiest bunnies you will ever meet and the pictures do not do me justice. I need to know that whoever adopts me loves me the way I am. They must be willing to give me the chance to eventually come out of my shell given enough time and love. I have been in foster care for a year at the SaveABunny foster center and I am ready to expand my circle of trust. I will probably always be shy, but you can help me find joy again. Thank you very much for caring about me and reading my story.